The highest peak of North America, Mont McKinley – AKA Denali – measures 20,320 feet at its snowy summit but, the mountain’s vertical relief of 18,000 feet is greater than that of Mount Everest sitting on the high Tibetan plateau. In addition to that, it is also one of the hardest to climb (only 36% success this year, 53% on average) not because of its technical difficulties but because of the extreme weather conditions climbers encounter, the toughest on the Planet. Temperatures as low as −100 °F and wind chills as low as −118.1 °F have been recorded. In light of these figures, we decided only to be a part of the 30% Club, as only 30% of visitors to the Denali National Park ever actually get to see Denali at all because of the almost constant cloud cover … this would be a good enough achievement for us ;). 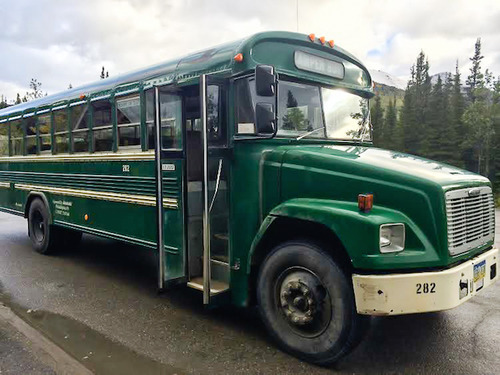 At 10 AM, the over 65 years old silver-haired Alan shows up behind the wheel of his green camper bus – a converted school bus – one of the only vehicles besides tour buses allowed to drive through the park. A dozen campers/hikers load their fully packed bags into the back while I help stack them up inside, a move that allows me to pick the one and only heated spot behind the driver. Good thinking as we were boarding for a 5 and a half hour drive with temperatures no more than 37°F. Before we start out, Alan inquires as to everyone’s destination. 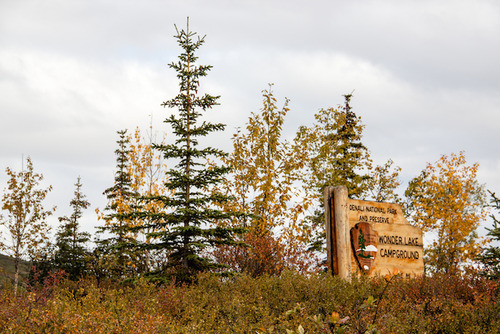 While a few say they will be dropped at the parks lower campgrounds, the rest of us would be jumping off the bus either in the middle of freaking nowhere along the only road that snakes through the park, or in the very last and furthest campground: Wonder Lake, where we are heading. 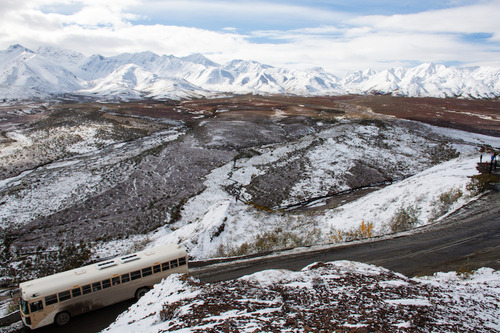 Alan immediately makes things crystal clear to everyone aboard the bus: ”The park has encountered its first snowstorm of the season the previous day and there is at least a foot of snow everywhere. So, if you don’t have snow gaiters for hiking and a below-freezing sleeping bag, you had better quit the trip right now, ‘cause once ya’ up there, ya’ up there!”. I turn to Nick, who has an insane grin on his kid-amazed-by-the-idea-of-snow face, look down at his canvas pants and upgraded sneakers … and to my very concerned «Are you really sure about THAT?» he responds with an even more firm and excited «Oh Yeah Baby !». 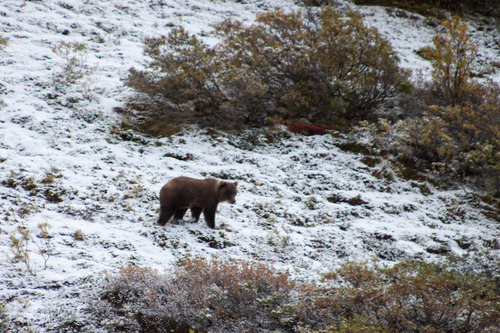 We quickly have a glimpse of what this is all about: we spot a grizzly bear walking along the mountain slope, totally visible about 80 feet away from the bus. He seemed to be way less curious about us than we were about him and he quickly tried to withdraw himself from our sight. Hard to say how big he is, but definitely big enough for us to be happy that we’re in the bus as the mandatory distance for viewing a bear safely is about 200 feet away. He is beautiful. You can sort of see on the picture how big his paws are. To give you an idea, they would definitely be big enough to rip your head off if you gave him the opportunity, but holy cow how amazing of an animal this is! Hard to believe this massive amount of fat and muscle can be sustained with him eating “only” around 200,000 berries a day. 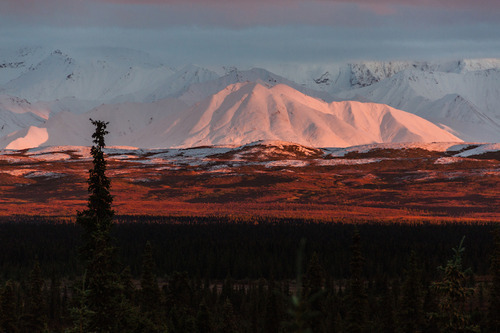 As we continue our trip along the cliff overlooking the snow covered tundra at the foothills of Alaska Range, Alan dishes out plenty of facts and anecdotes about the park and his experience among the wilderness during all those years he has been driving through. 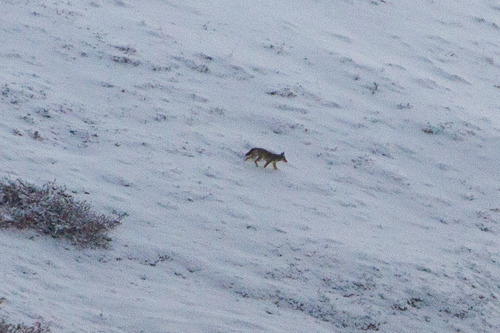 A little bit further into the park he spots what he thinks to be a grey wolf/coyote hybrid (see picture below for the connoisseurs). Though never confirmed scientifically, even the park rangers rely on this prognosis. 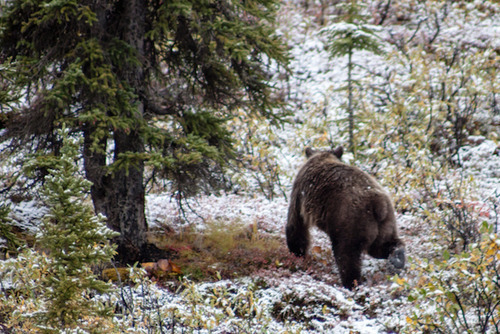 After a second hour in the bus, another brown bear shows up on the slope at a distance – this time over 300 feet away – running uphill to hide from the multiple buses starring up at him. Literally bouncing from his rear to front legs, we can tell that even in knee-deep snow he is going very fast and in a race, you would not stand a chance. 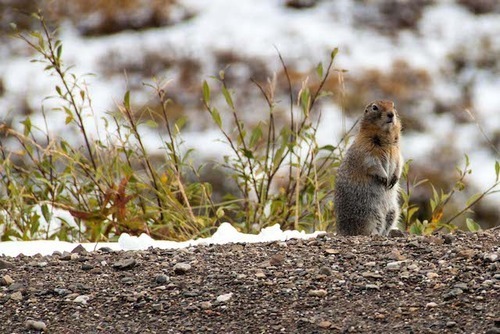 The last wildlife we see while on the bus are awesomely cute little ground squirrels, standing up on their rear legs on the side of the road looking all over the place frantically like a meerkat might. Finally around 4PM, we have a glimpse of the eagerly awaited Wonder Lake from the south side. While not the most impressive side of the lake, it was definitely good enough for us to dearly thank Alan for all of the rich experiences he shared with us, jump off the bus, pitch the tent in (thank god!) NO snow and run to the lake as quick as we could. Although what we are surrounded by seems to be magical, the most impressive thing here is that nature has this singular power to turn magic into reality. 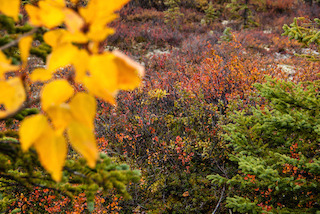 The wide range of fall colors, from crimson to gold, warms up the crispy alpine air coming from distant glaciers. 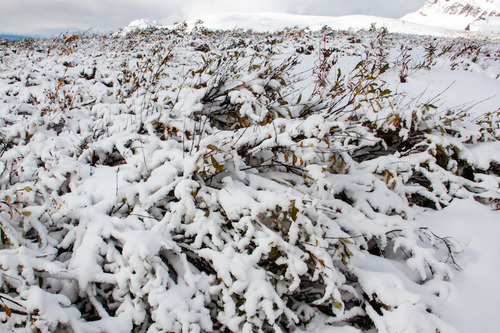 The sharp scent of the resin from surrounding spruces combines with the fragrance of the freshly crushed wild herbs. The textured brushes graze our legs while our feet sink deeply into the spongy moss with every step. All the senses are fully stimulated. All of a sudden it is like we were propelled into the heart of the wilderness while the feeling of being out of place in a land untrammeled by man is growing. Neither of us has ever been in such a remote place, hundreds of miles away in every direction from the first sign of modern civilization, left to ourselves with only the contents of our bags. I can tell you that as amazed and appreciative as we were, it was a bit frightening to rely on the 6 small meals we packed and the possibility of the road being closed in event of an unexpected snowstorm. But, the sun was shinning and there were plenty of blueberries for us to compete with the bears for! 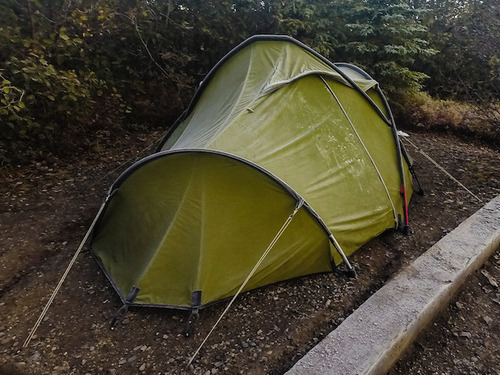 Our first night will be the one to remember as the coldest we ever had, and this is what Micheline ended up looking like in the early hours the next morning. 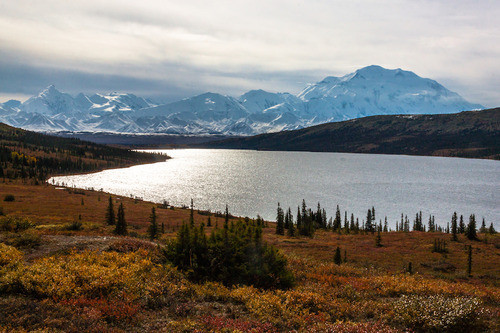 We spend the day starring at Denali from different sides of the lake and reminding ourselves how lucky we are to actually have a clear day to enjoy its imposing presence at only a short 26 miles away from us. We are so impressed that we almost starve ourselves after walking for miles away from the camp forgetting about food (still, the bear thing…) when we met a salutary couple who spontaneously threw carrots and trail mix at us right before we would decide to try some wild berries. So, besides ourselves, the only wildlife spotted this day were the thousands of migrating sandhill cranes loudly trumpeting above our heads and a bunch of ground squirrels. We went to bed fairly early, but not without enjoying a glimpse of the crazy sunset by our tent entrance. This morning is our last one and we are ready to board the 6:30AM bus but we miss it by 2 minutes, meaning all we have left to do for the next hour is enjoying our last bit of wilderness before the 6 hours long, not so progressive, come back to the civilization. As much as we would have loved to stay longer, we knew we had the best weather conditions ever – sunny all the way even if rather cold – and we would have had to face the coming rain/snow with no way to warm up at all, the campground being limited to toilet stables, bear-proof food lockers and a couple of covered tables to cook on. 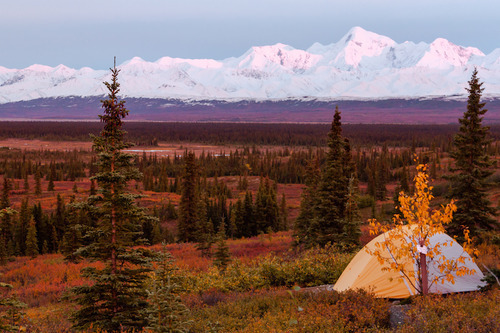 We have been fortunate and privileged enough to enjoy all the best Denali had to offer – twice actually with the day of the flight – and we don’t want to push our physical limits too far. Ok, let’s just say MY physical limits.